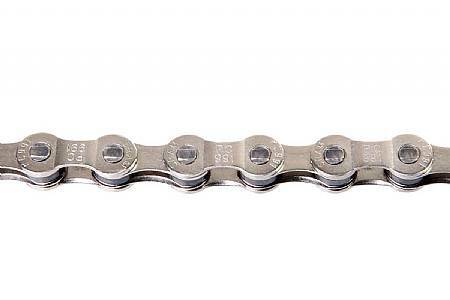 9-speed chain that works great. I have always used this chain. Shifts smoothly over the nine-speeds, never had a problem. I change it about once a year with a new cassette. The chain was purchased to replace a worn out shimano chain. The bike is a Klein Quantam Pro I ride on the trainer. The chain shifts great with the ultegra components and no tools required makes for a easy installation. I've never had one of these chains break. I have only replaced them when they measure as stretched beyond tolerance. I log plenty of miles before that happens! I've been using this chain for years in all kinds of weather and grit... usually change it between 1500 and 2000 miles and not too much wear (within spec). The master link is the best feature. The chain worked fine and was easy to install. I removed the extra links with the tool I have without too much trouble and the master link went together with fingers. Great chain - long lasting and power link connector is great. Easy to clean on the bike or off. Never had any problems over many years of using this product on numerous bikes.